Competitor Group, Inc. (CGI) today unveiled the new look of VeloNews, North America's oldest bike racing magazine, with a new name, Velo. The magazine's redesigned cover premieres with the August issue, on sale July 19th. The word "News" leaves the print publication, but will remain intact for its online audience at VeloNews.com to access up-to-the-minute breaking news and on-the-ground race coverage, photos and video. The magazine's editorial will continue to feature the biggest stories in cycling, from events and personalities to cutting edge technology. The name change is a continuation of the evolution for the brand that began nearly 40 years ago as Northeast Bicycle Racing News, which became Cyclenews then Velo-news to VeloNews and now Velo. 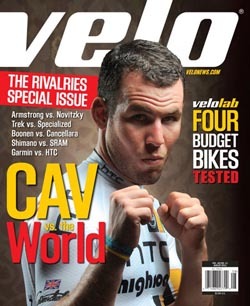 "Without a doubt Velo Magazine is the best bicycling magazine in the world and this new direction will separate our outstanding print product from our online news outlet at VeloNews.com," said Bouker Pool, SVP of Marketing at CGI. "Readers won't find our VeloLab bike testing, our insider analysis and our engaging storytelling anywhere else but in the pages of Velo." Velo, the Journal of Competitive Cycling, is North America's most trusted source for information about the individuals, events, and equipment that comprise the world of bicycle racing. Velo reaches serious bicycle competitors - present, past and future - as well as the retailers, suppliers, and service providers who are at the leading edge of cycling. Online since 1994, VeloNews.com delivers the most timely, trusted cycling content on the Web. For more information, please visit VeloNews.com. Headquartered in San Diego, Calif., Competitor Group, Inc. (CGI) is the leading active lifestyle resource dedicated to promoting the sports of running, cycling and triathlon. CGI is a portfolio company of the investment firm Falconhead Capital, which specializes in growing companies in the consumer sector of the leisure and lifestyle space. CGI owns and operates more than 55 events around the world, including the Rock 'n' Roll Marathon Series, TriRock Triathlon Series and Columbia Muddy Buddy Series; which will deliver more than 450,000 professional and amateur participants in 2011. CGI publishes four magazine titles including Velo, Inside Triathlon, Triathlete and Competitor with a combined monthly circulation of more than 600,000. In addition, the company hosts a captive lifestyle community online at competitor.com, delivering over 2.5 million monthly unique visitors and 22 million page views. Further information about CGI and its media properties can be found at Competitormediakit.com.